Today I’m excited to host historical author Debbie Lynne Costello here on my blog! It’s been a blessing to get to know Debbie a bit as she has welcomed me as a new blogger on the Heroes, Heroines, and History blog, of which she is a hostess. 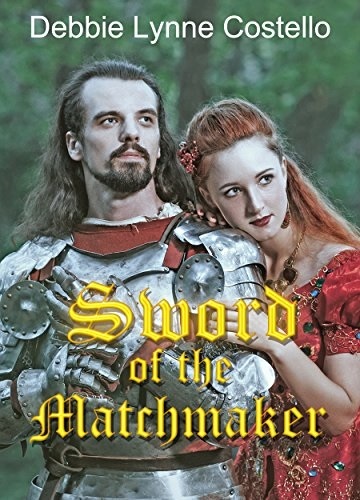 In addition to sharing some of her personal story with us, Debbie will also be doing a giveaway of her latest medieval novel, Sword of the Matchmaker, so be sure to enter by commenting and clicking on the links below! Also make sure to continue following Debbie’s blog tour by visiting the Overcoming with God blog, hosted by Carrie Fancett Pagels, at this link tomorrow. 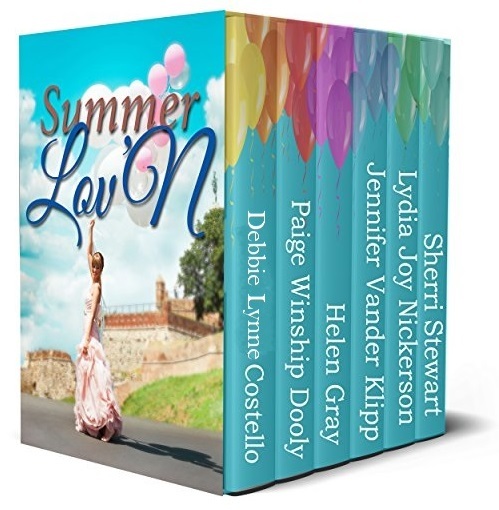 Thank you, Kiersti, for having me on your blog for this blog tour. I’m looking forward to chatting with your followers. When I asked you what you’d like and one of my choices was faith and trust, I knew I had to share a part of our recent story. Many of you know that my husband, Joe, was diagnosed two years ago with Mantle Cell Lymphoma, an incurable rare form of Non-hodgkins Lymphoma (incurable in man’s eyes but not in God’s!). That rocked our world. But not God’s. He knew the day Joe was born and the day I was born that this would be a journey we would have to travel. 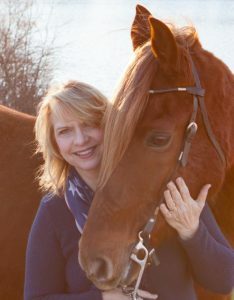 Debbie with one of her horses–she loves her animals! showed Shetland Sheepdogs (aka shelties) at the time. I had a woman call me, looking for a puppy. She was from Houston, a nurse, and working in Charlotte, NC about 45 minutes from where I live. She picked out her companion and came by weekly to bond with the puppy she named Darcy while she waited for her to be old enough to go home with her. That time of bonding with her puppy developed a friendship between us. We found we had a lot to talk about. It was about eight months after she took Darcy home that her travel nurse contract expired and she took another traveling nurse job up in Connecticut. One day I received a phone call from Lesley. She was upset. A freak accident happened and she watched her dog get killed. I was the friend she called because she knew I’d understand the pain she was going through. As it happened, I once again had a litter of puppies. Four to be exact, but only one that wasn’t spoken for. She flew down shortly after to get that puppy from me. Though our friendship had been established, this turn of events seemed to cement the relationship. We called each other and kept up with how each other was doing. We’d share prayer requests and through her prayer requests and sharing I felt like I knew some of her good friends. As the years passed she’d come visit us and my kids loved their Aunt Lesley. She’d stay up late and watch movies with them, introduce them to new foods, and have invisible sword duels with them—“My name is Inigo Montoya. You killed my father. Prepare to die!” She became part of our family and we always looked forward to her visits. Fast forward ten years. Lesley called, asking us to pray for her best friend’s husband who’d had a stroke. The following years we would get phone calls updating us on her best friend, Veronica, and her husband and asking for prayers. I really felt like I had gotten to know Veronica even thought we’d never met. Fast forward again eight years more. Lesley calls to ask us to be praying because Veronica’s husband isn’t going to make it long and wants us to be lifting the couple up. He passes shortly after. Weeks later, my husband goes into the doctor for a yearly check on his lungs. They’re clear, but the doctor notices a lump on his collar bone and is concerned. Joe goes to see a surgeon who takes out the lump and discovers the Mantle Cell. Joe has already done his homework and recognizes the rare cancer. It was not a good diagnosis. No cure and a three-to-seven-year survival rate. We have several appointments with the oncologist that week. But something didn’t feel right to me. One day we were there and started to feel pressured to begin the chemo the next day. It’s a terrible feeling to be fighting for your life and at the same time feeling pressure from the doctor who is supposed to be saving you. We called Lesley, right there in the room. She talked to the doctor and then told us to get up and walk out of the office. We did. That night my daughter, who is a PA, and Lesley did a three-way call with us. They begged us to get a second opinion and not to start the chemo in the morning. Lesley told us to go to MDA in Houston. She’d already spent several nights researching the best hospital for Joe’s cancer. MD Anderson was one of the top research hospitals in the country. Thinking ahead and prepared, she’d called Veronica, and that sweet lady welcomed us to stay with her even though she’d just lost her husband. So a month later we stayed with Veronica for a week while Joe went through tests. Lesley took time off from work and went to every appointment as well as my daughter. When all the results came back we were given a chance to enter a clinical trial, but with a slight hitch. We would have to live in Houston for a total of five months. Veronica offered her home to us. There wasn’t one day that we stayed there that I ever felt like a guest. I always felt like it was my home. Veronica has a gift of hospitality and made us feel welcome every moment of every day. But not only that, we visited her church and fell in love with the people from the first day. It was like coming home. God is AMAZING! So let’s go back to that first paragraph. Twenty years ago God KNEW this was going to happen, He set His plan in motion by placing a woman in our life looking for a sheltie puppy. He used every day things that one would think would disappear into the past, forever forgotten. But we serve a God who knows and cares for us. He plans for our lives in ways we many times don’t see. Twenty years ago we never would have seen this picture, but God has given us the opportunity to be able to look back and see His hand on our lives, guiding us, and planning for our future. Happy Note: Joe finished the clinical trial. We return to Houston every four months for a PET scan and we stay with Veronica and many times see Lesley who lives in the Dallas area now. Joe is cancer free. The doctors are hopeful that this trial will be a cure for some. I believe God has cured Joe because He used people I didn’t know to confirm that to me. But that is another story! So how about you? Have you looked back in your life and seen how God has moved when you were totally unaware that He was doing so? Please comment and share! And to enter the special Rafflecopter Giveaway, click this link. There will be lots of ways to earn points. 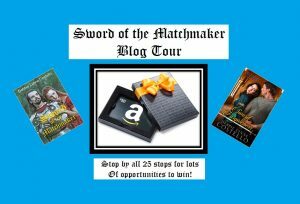 I will be giving away a kindle fire with Sword of the Matchmaker, $15 Amazon gift card and much more! 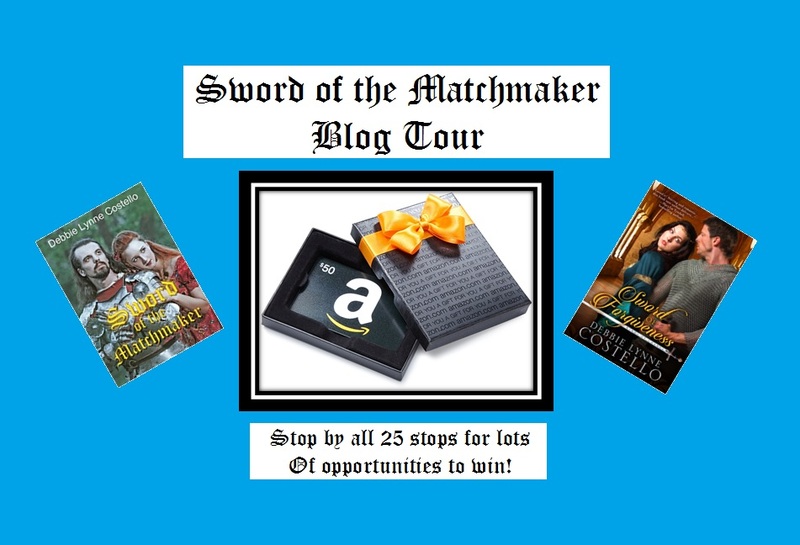 On top of the rafflecopter giveaway I’ll give away a copy of Sword of the Matchmaker (if you have purchased the book you can choose one of my other books) if we have 10 different commenters. Leave a comment or ask me or Brithwin a question to be entered. We’ll announce the winner after 7 days. Penelope Beatty made up her mind long ago she would live and die a Scottish warrior, not a wife. But when nearly all her clan is killed and she is betrayed, she loathes doing the unthinkable, but must seek the help of an Englishman who owed her father his life. Thank you for having me on your blog, Kiersti! Looking forward to visiting with your peeps! Hi Kiersti and Debbie! Waving. Debbie, I knew something about Joe’s story, but didn’t know the “rest of the story,” as Paul Harvey used to say. How amazing to see how God works in our lives. I have also seen his hand in mine as I look over my life, but we won’t go into that story now. Thank you for sharing, and may God continue to bless your family and your writing. Hey Marilyn! It is so amazing to see how God was preparing things for 20 years down the road! We serve such an awesome God!! Thanks for stopping by. Your horse is beautiful! Congrats on your book! Thank you, Alexis! He’s a Tennessee Walking Horse. I love him. And thank you! It’s always a good feeling when you see your book come out in print! Wonderful story about Joe? Lesley and Veronica. God does use people ww don’t even know. GOD has our roads planned, all we have to do is daily walk it. Thanks for sharing…. Hello, Claudia. I stand in awe of my God who cares enough to put people in my path I would need twenty years later! What an awesome God! And for Him to send these two particular ladies…forever friends who have touched my life so deeply. Veronica and I have only known each other 2 years but I love her like a sister and as I mentioned above, Lesley has become part of our family. God not only rescued us from MCL but he enriched our lives in the process! Debbie, how did I not know you’re an author? I loved reading the story of your journey, of which I knew only a small part. Lavena!!! Thank you for coming by! I just friended you on FB and see you are a bookaholic! Veronica has been keeping secrets! LOL! Here are 2 more blog posts about our journey (different stages of it) if you’d like to read them. Thanks so much for stopping by and saying hello!! I’m so excited to see you here!!! This is a heroine that I like and she needs a man that understands the role she will play in his life. Her talents cannot be hidden. Hey Sonnetta! Thank you for coming by! You understand Penelope! She sure does and I think a certain Knight is about to find out just how much talent she really has!